This week witnessed the second determined attempt by Islamic State forces to destroy the Kurdish enclave around Kobani (Ayn al-Arab) city in northern Syria. Kobani is one of three autonomous enclaves maintained by the Kurds in Syria. As of now, it appears that after initial lightning advances, the progress of the jihadis has been halted; they have not moved forward in the last 24 hours. The arrival of Kurdish forces from across the Turkish border is the key element in freezing the advance. 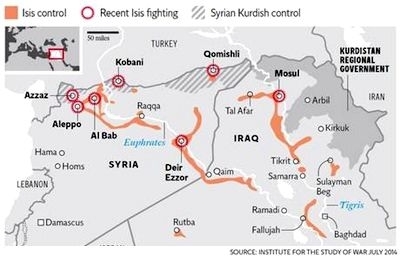 Yet Islamic State has captured around 60 Kurdish villages in this latest assault, and its advanced positions remain perilously close – around 14.5 km. – from Kobani city. Around 100,000 people have fled Kobani for Turkey, from the enclave's total population of around 400,0000. Islamic State employed tanks, artillery and Humvees in its assault, according to Kurdish sources. The Kurdish People's Protection Units (YPG) have no comparable ordnance. However, their fighters were assisted by Kurdistan Workers' Party (PKK) guerrillas who crossed in from Turkey, and appear to have played a vital role in halting the advance. Whether the current situation will hold is not yet clear. But the commencement of US and allied bombing on Islamic State in Syria probably means the jihadi forces will have more pressing issues to attend to for the moment. The assault on Kobani indicates that Islamic State is turning its attention back to Syria. The Kurdish enclave has long been a thorn in the side of the jihadis; the Kurdish-controlled area interrupts the jihadis' territorial contiguity, separating Tel Abyad from Jarabulus and making a large detour necessary from Islamic State's capital in Raqqa city to the important border town of Jarabulus. For this reason, the jihadis have long sought to conquer the area. Abu Omar al-Shishani, the much feared Chechen Islamic State military commander, is reputed to have made the conquest of Kobani a personal mission. With the weapons systems captured in Mosul now fully integrated, and with further progress in Iraq impeded by the presence of US air power, it appears Islamic State is now making its most serious effort to achieve this goal. The Kobani enclave has long been an isolated, beleaguered space. This reporter visited there this past May; at the time, Islamic State was trying to block the supply of electricity and water into the city. Skirmishes along the borders were a daily occurrence. Particularly notable also were the very strict border arrangements kept in place by the Turkish authorities to the north – in stark contrast to the much more lax regime maintained facing the areas of Arab population further west. As of now, a determined Kurdish mobilization appears to have stemmed the jihadi advance. Unless the picture radically changes again, Kobani looks set to remain a thorn in the side of Islamic State. Perwer Mohammed, 28, an activist close to the YPG in Kobani, sounded worried but hopeful when speaking from the city on Monday: "They are now on the outskirts of Girê Sipî [Tel Abyad]. But they will have to pass through our flesh to get to Kobani, and they are no longer advancing from the east." A variety of forces contributed to the mobilization; 1,500 PKK fighters arrived in Kobani city to reinforce the YPG there, according to Kurdish sources. In addition, forces loyal to both the Kurdistan Regional Government of Massoud Barzani and to the Patriotic Union of Kurdistan (PUK) are set to arrive in Kobani. The PUK forces, according to the organization's website, are currently on the Iraq-Syria border, waiting to deploy. The YPG itself, meanwhile, is trying to push forces through from Ras al-Ain to Tel Abyad on the eastern edge of the enclave. A concerted Kurdish military effort is under way. Suspicions remain regarding possible collusion between Turkish authorities and Islamic State. The Kurds have long maintained that at least in its initial phase, Islamic State was the beneficiary of Turkish support. Evidence has emerged of Turkish forces permitting Islamic State fighters to cross back and forth across the border during early clashes with the YPG. The subsequent picture remains shrouded in ambiguity, as Turkey officially denies any relationship with Islamic State. But the release of 49 Turkish hostages by the terror movement this week under unclear circumstances has once more cast a spotlight on the possible complex connection between the two. If the situation in Kobani holds, this will offer proof of the limitations of Islamic State forces. In Iraq, their advance has been stopped by the coordination of US air power with Iraqi and Kurdish forces. In Kobani, as of now at least, the jihadis appear to have been stalled by determined resistance on the ground alone. Yet the last chapter remains to be written. Should Kobani fall, large-scale massacres of the type which befell the Yazidi communities in the Mount Sinjar area in August would inevitably follow; this is likely to result in a massive new refugee problem. Moreover, an Islamic State victory would consolidate the borders of the jihadi entity considerably. The clash between Islamic State and the Kurdish autonomous areas also has broader ramifications than merely tactical military significance – it shows the extent to which "Iraq" and "Syria" have become little more than names. In Kobani, two successor entities to these states are clashing. The Kurds have organized three autonomous cantons stretching east to west from the Syria-Iraq border to close to the Mediterranean coast. The Sunni jihadis, for their part, have organized their own "state," going southeast to northwest. Kobani is the point at which these two projects collide. Hence, the outcome of the current fight will indicate the relative strength of these two very different projects. Yet the clash itself offers a broader lesson regarding the shape of things to come, in the ethnic/sectarian war now raging across what was once Iraq and Syria. Jonathan Spyer is a senior research fellow at the Global Research in International Affairs (GLORIA) Center and a fellow at the Middle East Forum.